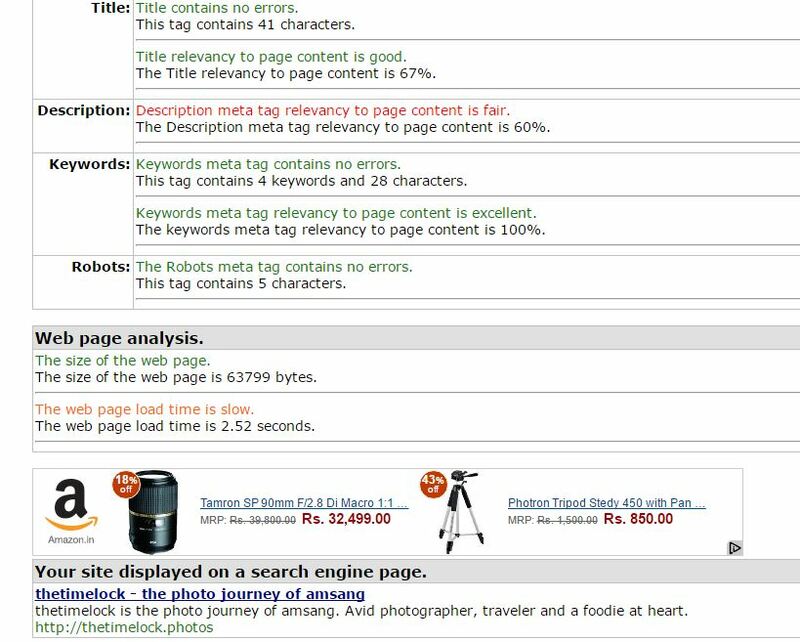 Meta tags consists of site title, site description, site keywords, robots and author. It is a method to show tell Google Search things about your website which can be displayed in the search results. Good thing is that Google will display exactly what you have entered in the search results. So it is a good idea to configure this and fine tune it to the last word. Please note we will be limiting this article to a self hosted WordPress website. Here is the Google explanation for meta tags. Basically it is that information what you as a webmaster want to feed to Google and in turn Google search engine. Here is how the information for a website http://thetimelock.photos is displayed. 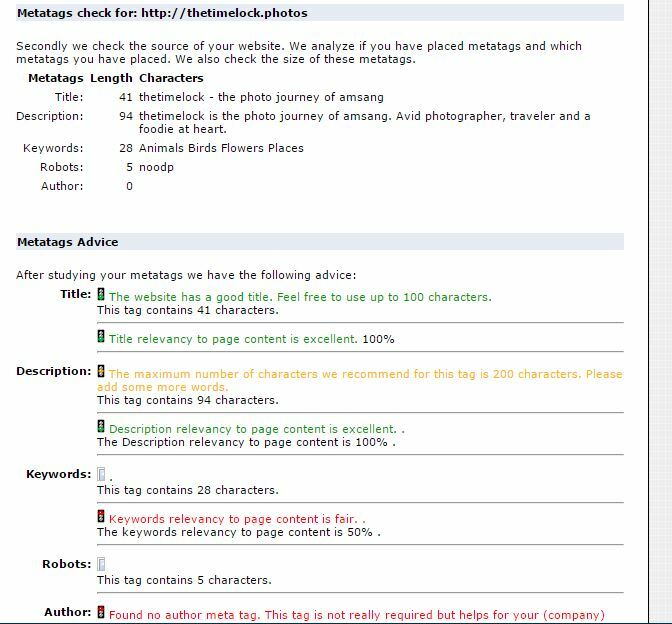 Site Title and Site Description is clearly visible in the search results which signifies everything ok. To carry out a detailed check for meta tags we can use online tools which are available in plenty. We used the following sites for checking the tags. and we also used the following site. Due to the limited scope of this article, I would suggest use of a plugin for WordPress users. 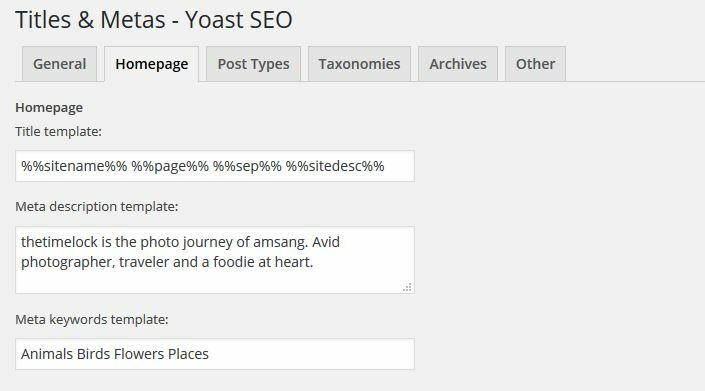 There are a number of plugins available to do this job, but if you are using SEO by Yoast, this plugin handles all the work. The options are found under Titles and Meta. Remember first you need to enable meta keywords under Others. This feature is not enabled by default. You can either use the default template or choose a template which suits your requirement. If you need help click on the top right which gives all the template options. You can also insert your own text and that will appear in the Google Search results. Another good thing about this is that google shows the changes almost instantly. 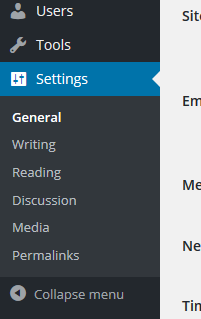 Incase you are using a static page as home page then you can edit the on page SEO settings as shown. 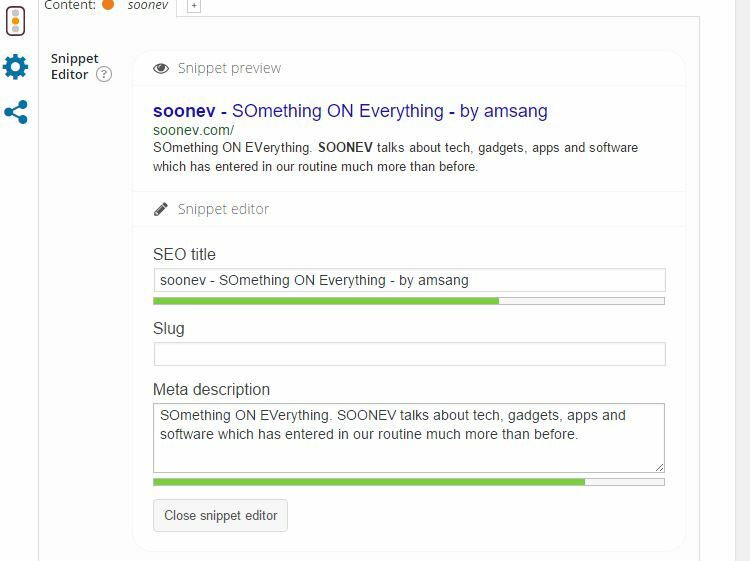 Meta Tags is a nice way to show your website on Google Search. Customise them now. The article is useful for me. It brings clear vision on the matter. I am following your articles. Thanks for very churning out such relevant and useful posts. Nice that you are liking my posts and finding them useful. Thanks. Your post on Christ Church is nice. Dates are also nicely listed. amsang recently posted…Flipkart App, Now the better choice. Thanks Rupam. I also liked your post on Happy Holi….nice colours.